With Nashville Charter Bus, finding the right bus for your trip has never been easier! We offer a variety of models, sizes, and amenities, so we are sure to find the perfect vehicle or combination of vehicles to suit your needs. Our team is available 24/7 to assemble a custom fleet for you! Read more about the buses we charter below, or call 615-229-7076 for more information. 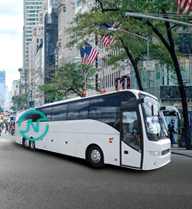 Enjoy your long-distance trip with a 56-passenger charter bus. This full-sized motorcoach will ensure all passengers stay comfortable and relaxed, no matter the distance. 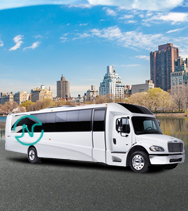 Equipped with amenities such as reclining seats, extra legroom, WiFi, and more, this bus is your best option for all of your inter-city group travel. An affordable and efficient option for medium-sized groups, the 20-passenger minibus is made with a comfortable and modern design. 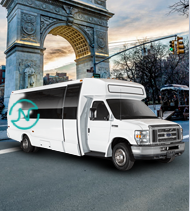 This model is perfect for employees, students, and tourists that are looking for a quick, efficient solution to transport them to and from corporate gatherings, campus events, and day trips. Smaller groups can also enjoy comfortable, efficient group transportation with the 18-passenger minibus rental. This model is perfect for shuttling small groups short distances around town. Its compact size allows easy travel across busy streets, while its roomy interior ensures passengers’ comfort. 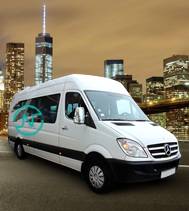 Keep everyone together on your next local trip with a 25-passenger minibus. This model is perfect for small- to medium-sized groups who need efficient, short-distance transportation. You'll receive a durable and comfortable bus as well as a knowledgeable driver for your trip to Nashville's top sights.